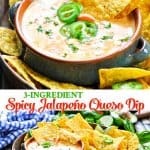 ​​​​​​​This 3-Ingredient Spicy Jalapeño Queso Dip is the best queso recipe that you will ever taste! Plus, it can be made in a slow cooker, in the microwave, or on the stovetop! Thanks to Red Gold Tomatoes for sponsoring this post. All thoughts and opinions are 100% my own. This 3-Ingredient Spicy Jalapeño Queso Dip is the best queso recipe that you will ever taste! Plus, the easy cheese dip can be made in a slow cooker, in the microwave, or on the stovetop for a simple tailgate appetizer! I live in a house with 4 football-loving boys, so needless to say, fall is their happiest time of year! Whether they’re standing on the sidelines at a local high school game, tailgating at a nearby college, or glued to the television to watch the Sunday NFL games, my guys are all-in at this time of year. So what’s my role in this? Well, let’s just say that it’s NOT updating fantasy football rosters! 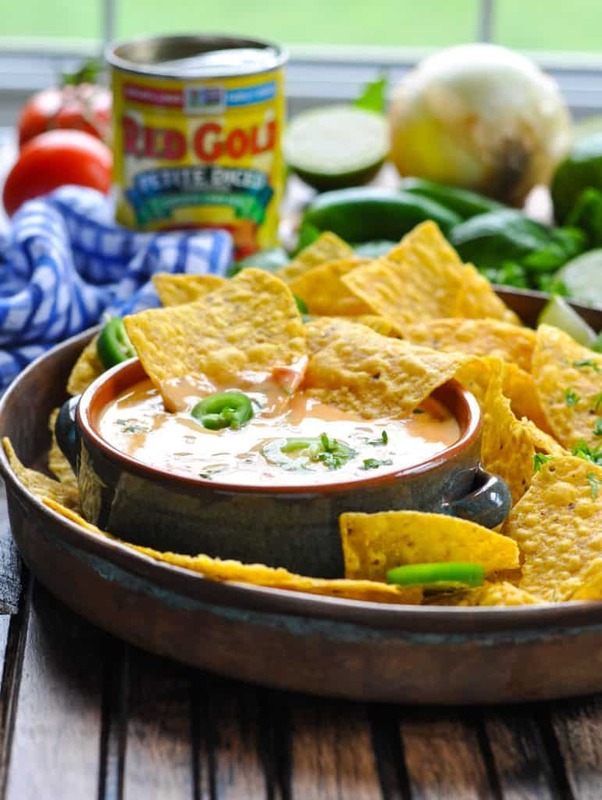 Instead, I’m in charge of the game day snacks — and this spicy queso dip is the latest fan favorite! WHAT IS QUESO DIP MADE OF? Let’s start with the 3 basic ingredients! 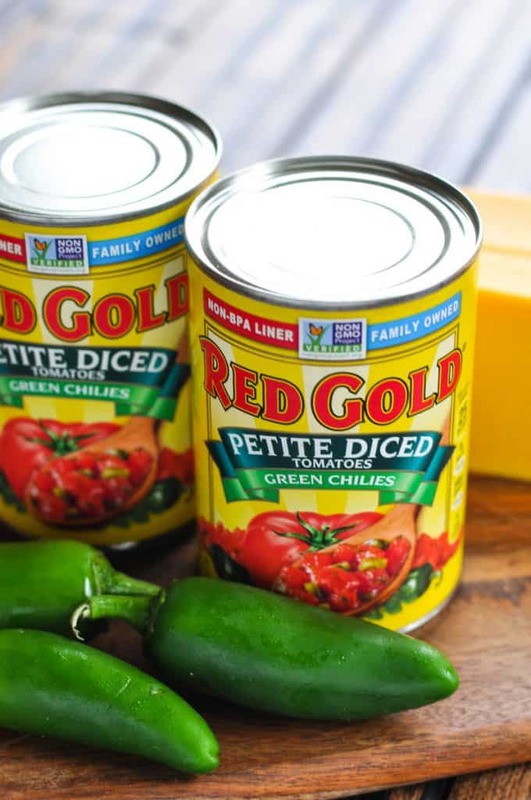 You’ll need Velveeta cheese, fresh jalapeños, and Red Gold Petite Diced Tomatoes with Green Chilies. I prefer the Red Gold Tomatoes because they are family-owned and sustainably grown on Midwest family farms. The tomatoes are steam packed fresh, non-GMO Project Verified and come packed in Non-BPA/BPS lined cans. 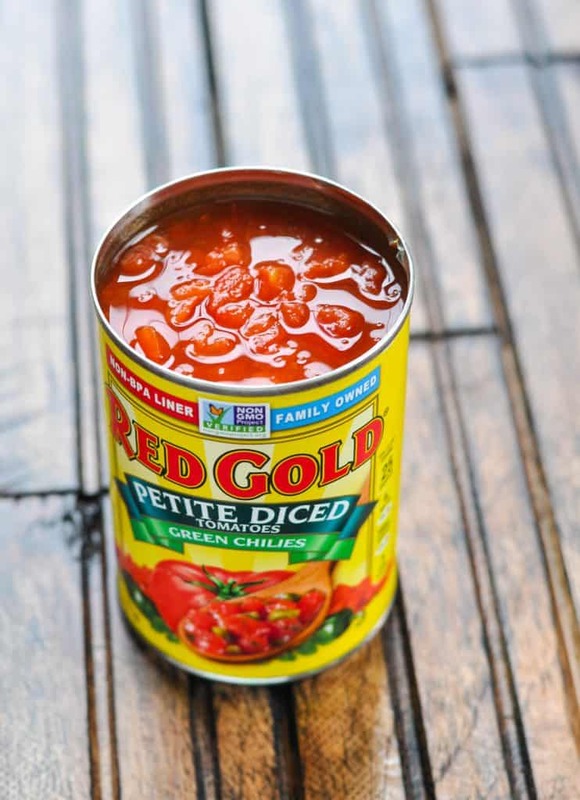 The Red Gold family is passionate about quality, which means that you get the freshest, best-tasting tomatoes on the market. Of course, the best tomatoes make THE BEST queso recipe! Can you see those finely-diced tomatoes? That makes them perfect for smoothly blending into this dip, and the kids prefer when there aren’t huge chunks of tomato to contend with! 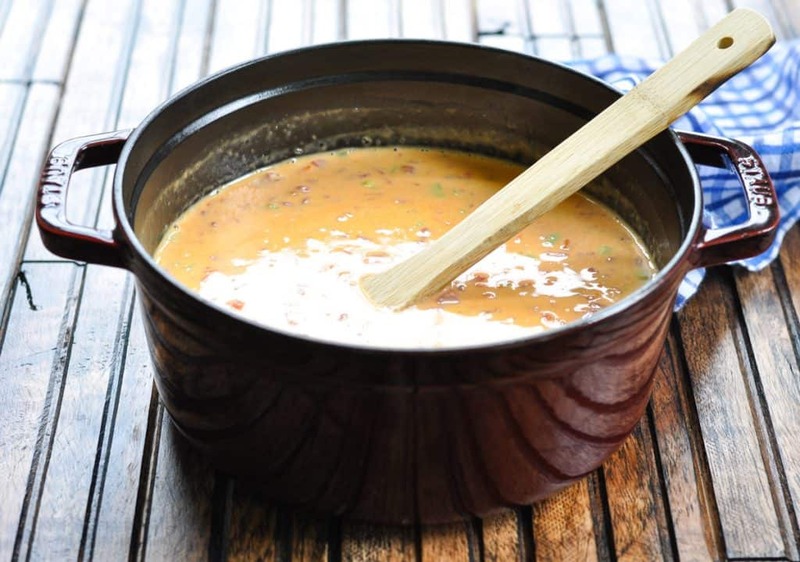 I’ve prepared many different versions of queso dip over the years, with a variety of different cooking methods. This recipe works well in the slow cooker, on the stovetop, or in the microwave, so you can choose the most convenient option for your particular gathering. You can’t beat the convenience of Crock Pot appetizers when transporting food to a tailgate or to a party in someone else’s home. Plug in the slow cooker and your dip stays warm all evening long! 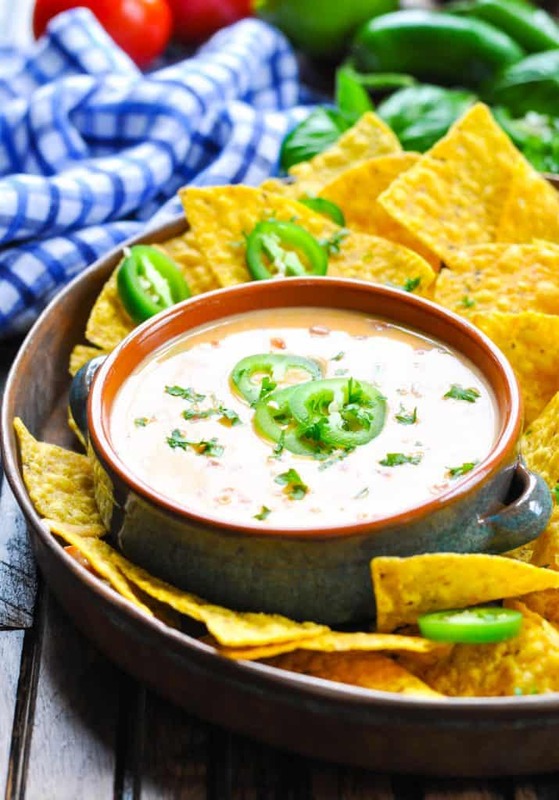 This zesty slow cooker cheese dip cooks on LOW heat for 2-3 hours or on HIGH heat for 1 hour. You’ll know it’s ready when the cheese is melted! This is the fastest method for those moments when a queso craving strikes! Just place all of the ingredients in a microwave-safe bowl and cook on high for about 5-6 minutes, stirring halfway through. If you’re cozied up at home on the couch to watch the game, you can easily add all of the queso ingredients to a large pot and heat over medium-low heat until the cheese melts. Stir frequently as it cooks. This will only take about 7-9 minutes. Just in time for the next big game, I hope that you’ll grab a couple of cans of Red Gold Tomatoes, a block of Velveeta, and a few jalapeño peppers. This convenient, easy, crowd-pleasing appetizer will appeal to all of the big and little appetites in your home! 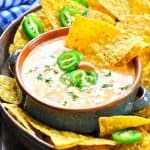 How to Adjust the Heat in this Spicy Dip: Keith has complained that regular queso recipes are “bland” and lacking in spice or flavor. That’s why he suggested that our recipe include fresh jalapeños to kick it up a notch! To keep it mild for the kids in the house, you can remove the seeds from the peppers and decrease the number of jalapeños that you use. Try just one pepper instead of two or three, and then offer additional sliced jalapeños as a garnish for those who like more heat! How to Make Queso Dip with Meat: For a heartier snack, try adding 1 lb. of sausage or 1 lb. of ground beef to the rest of the ingredients. Just be sure that you cook the meat in a skillet and drain off any fat before adding it to the queso. How to Reheat the Leftover Queso: Any leftovers keep well in the refrigerator and can be reheated in the microwave on high heat in just a couple of minutes! WHAT GOES NICELY WITH QUESO DIP? 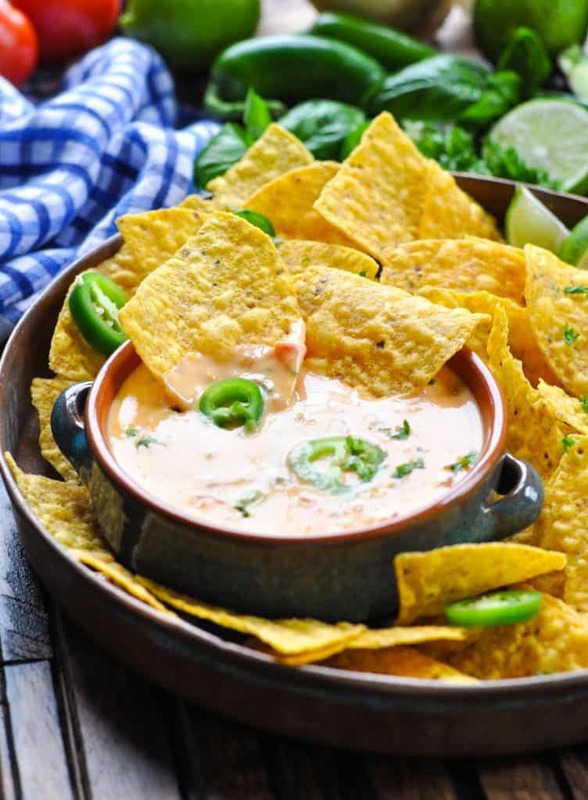 If you’re playing hostess to plenty of hungry football fans, try serving your queso dip with tortilla chips, crackers, soft or hard pretzels, additional fresh jalapeños, fresh vegetables (such as lightly steamed broccoli), sliced bread rounds, and fresh cilantro. And don’t forget a refreshing cold beverage on the side! 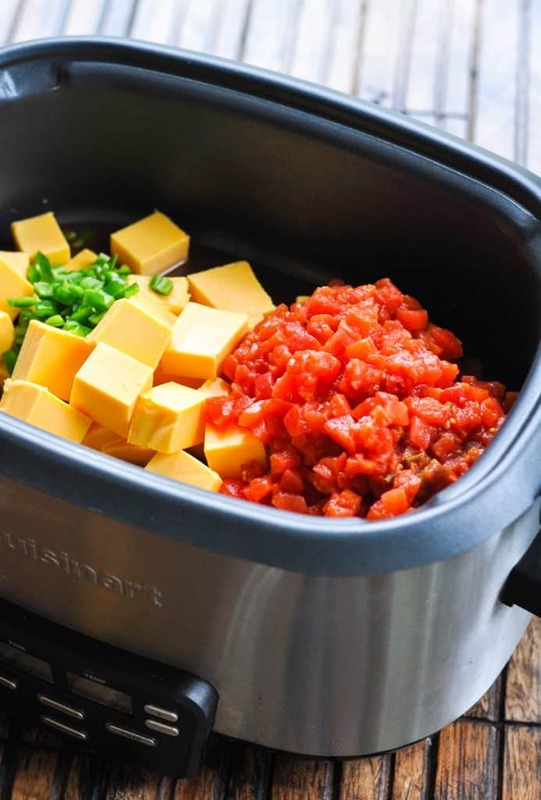 Combine cheese, tomatoes, and jalapeños in a 6-quart slow cooker. Cover and cook on LOW for 2-3 hours or on HIGH for 1 hour, or until cheese is melted. Combine cheese, tomatoes, and jalapeños in a large microwave-safe bowl. Cook on high for about 5-6 minutes, stirring halfway through. Combine cheese, tomatoes, and jalapeños in a large pot. Cook over medium-low heat, stirring regularly, until cheese is melted (about 7-9 minutes). *Use gloves when slicing the peppers or wash hands very well immediately after touching. Do not get your fingers near your eyes! This recipe yields about 6 cups of dip (or 48 2-tablespoon servings). Tip: If you’re serving a smaller crowd, you can cut the ingredients in half and prepare the dip in a 2 ½ - 3 quart slow cooker (or use a smaller bowl or pot). 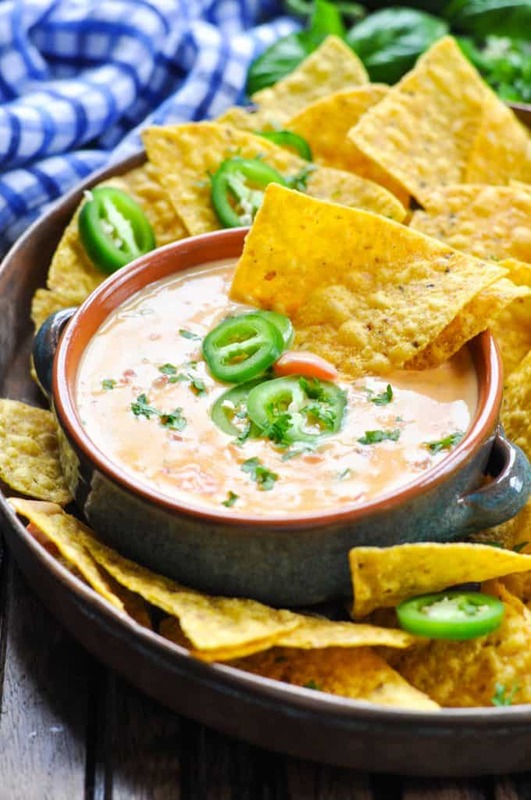 How to Adjust the Heat in this Spicy Dip: Keith has complained that regular queso recipes are "bland" and lacking in spice or flavor. That's why he suggested that our recipe include fresh jalapeños to kick it up a notch! That said, we have little kids in the house who also love a good party dip, so we need options to keep the recipe kid-friendly. I suggest that you remove the seeds from the peppers for a mild recipe. You can also decrease the number of jalapeños that you use. Try just one pepper instead of two or three, and then offer additional sliced jalapeños as a garnish for those who like more heat!